I’ve no idea whether it was biodynamically correct but everything in my blood yesterday morning said, ‘Time to sow some seeds’. I had a couple of contenders for an early start: sweetpeas and a plant called stevia. I don’t know what stevia will look like. For all I know it’s a nine-foot triffid that will stomp all over the allotments at midnight eating other people’s carrots. But its leaves, dried and crumbled, are the best sugar substitute going. The seeds had a bit of a dandelion look to them, I have to say. How lovely to be back in the greenhouse with the robin cheeping in the garden. I’m getting to pick up a few words in robin. 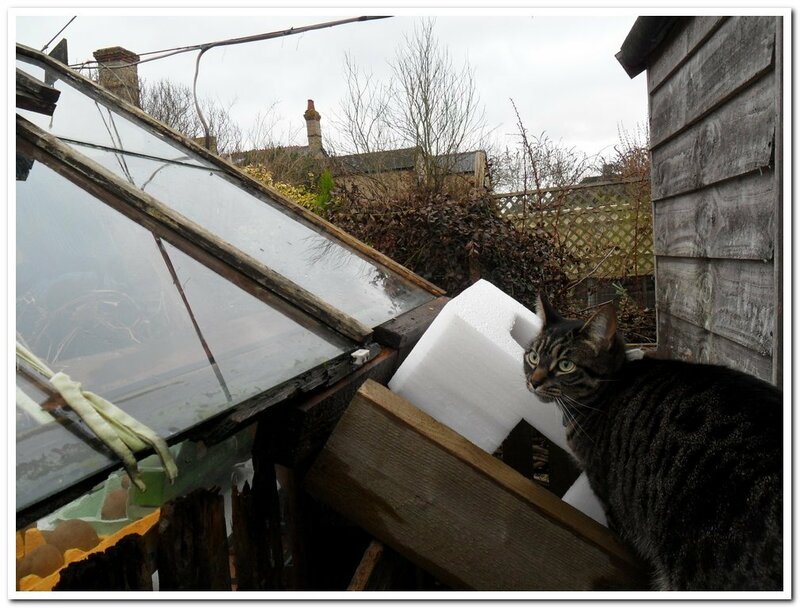 Today it was, ‘Cat, cat, bloody hell, cat, can’t you see the cat?’ True enough, Florence was out of hibernation and sitting on the wormery which overwinters in the greenhouse. She likes to be wherever I am just in case I happen to be passing a food bowl. Now I did wonder why a plant pot saucer on the bench was full of water, but it was some time after that that I realised why the robin was so loud and easy to translate today: a whole pane of glass was missing from the roof. How long has that been gone? Have we been heating the universe with our little fan heater at night? If the world ends a day earlier than it should, it’ll all be our fault. After lunch, we went out to fix it. It took two offcuts of old wood, two screws and a nail, and then another offcut and a great lump of polystyrene to fix the glass back in the frame. ‘Temporary measure,’ said David. It looks like my old greenhouse is on its last legs.